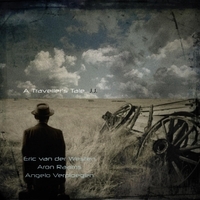 "A Traveller's Tale: J.J." is music that tells the tale of the ongoing quest for existential harmony in a life full of setbacks. A healthy dose of nostalgia covered in desolate impressions but with a big smile at what is coming. "J.J.", the second album by A Traveller's Tale, tells the story of Jean-Jacques (J.J.) Albanel, born in a small townhouse in New Orleans on March 12 1911. His journey through the American countryside, along large impressive cities, the in war-drawn Europe of his French father, to the land of unlimited possibilities and broken dreams. Besides the music of J.J. Cale, Tom Waits and Johnny Cash, the band was inspired by the cinematic road trips in stories as 'Blue Highways' by William Least Heat-Moon and 'Paris, Texas' by Wim Wenders. Kim Hoorweg - vocals on track 6 and 10. Recorded & Mixed January-March 2016 at the Cell 4 Studio Rossum The Netherlands by Arthur Theunissen. Mastered at the Q-Point Studio on April 20 2016 by Peter Brussee. All compositions by Eric van der Westen.